All manufacturers Adrenaline Obsession Advanced Aerospace Designs Aerodyne Research Airtec GmbH Akando Alti-2 Bad Seed Base Barigo Benchmade Benny-Who? Bev Suits Bonehead Composites Cascade Jumpsuits CLEARANCE Collette Tech Conceptus Cookie Composites Donovan Drazztic Action EG Sky Technologies, USA Eiff Aerodynamics, Inc. Elemental Enola Gaye Firebird Flex Z Goggles Flexvision Goggles Flysight Freefall Data Systems Fun Jump Rigging G-Form Gatorz GoPro Hypoxic Icarus World Join Keener Rubber Company Kestrel Kroop's Goggles Lane Sunglasses, Inc. Larsen & Brusgaard Liquid Eyewear Liquid Sky Sports M2 Mirage Systems, Inc. Mud Love NZ Aerosports Ouragan Suits Para-Phernalia Parachute Systems Paralog Parasport Italia Peregrine Manufacturing Performance Designs, Inc. Phoenix Fly Plexus Precision Aerodynamics Pro-Tec Raul Rigging Innovations RigSleeve Rock Sky Market Rothco Schutt Sports Shining Sun Enterprises (SSE) Sky Switches Sky Systems USA Inc Skydance Headgear Skydive Aerographics Skydive Chicago Skydive Ultimate Switch Skydive University Squirrel Strong Enterprises Sun Path Sunrise Manufacturing International, Inc. Tonfly Tony Suit United Parachute Technologies, LLC Velocity Sports Equipment Vertical Suits Viplo Altimeters Volitant Concepts WeatherFlow Windline, Inc.
Parachute Systems is one of the few manufacturers in the world that makes a complete system comprising the harness container and main and reserve parachutes. 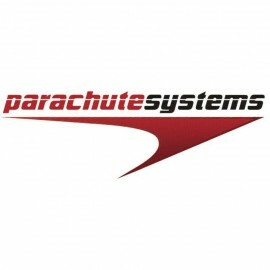 One of the most competitively priced product ranges internationally, Parachute Systems prides itself on excellent customer service. 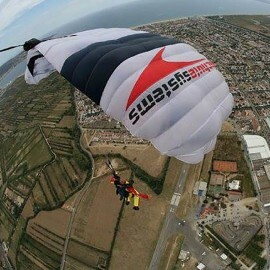 Parachute Systems There are 4 products. Hurricane is a fully elliptical canopy from Parachute Systems. Cash discounts available!! $1,931.25	Please contact us for current delivery times. Please contact us for current delivery times. 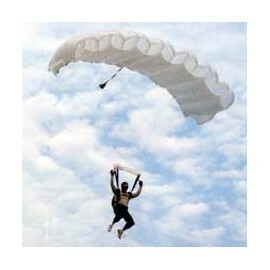 Volt Canopy from Parachute Systems. Cash discounts available!! Decelerator Reserve from Parachute Systems. Cash discounts available!! $1,122.50	Please contact us for current delivery times. The Ventus is a hybrid nine cell canopy giving it a lower pack volume. It is slightly elliptical like the Hurricane.